The Economical TTX is the ideal plastic strapping system for low volume users. Its simple open cabinet, bottom seal design makes it ideal for strapping bundles, cartons or coiled products. Strap tension and length are fully adjustable. Contrax Polypropylene strapping applied with Signode LBX Strapping Machines meets the new postal requirements while providing value to your customers. 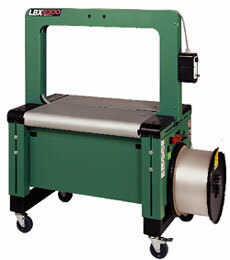 The low-cost TableTyer™ is the ideal plastic strapping system for low to moderate volume users. No adjustments, 24 VDC motors eliminate belts, solenoids and idler pulleys. Simple electronic design make for trouble free operation. operations. Ideal for high-volume applications with varying package or bundle types and sizes. machines provide the highest available speed, most reliable performance and lowest maintenance operation of any general-duty strapping machine on the market today. With timesaving features and 40% fewer parts, the LBX-2300 Series simplify operation and maintenance to save you time and money.